A major study examining how regional integration can provide both short and long-term solutions to the employment crisis in the Euro-Mediterranean region has concluded that domestic labour markets have failed to create sufficient employment opportunities – particularly for young people and women, including graduates. But, with the right policies in place, the percentage numbers of young jobless could consistently fall over the next 20 years. The reasons for current failures included skill mismatches, rigid regulation and limited deregulation, the weight of the public sector and its influence on educational choices, as well as issues related to the persistence of certain socio-cultural norms. Closer regional integration is essential for economic complementarities and can provide long-term solutions for youth unemployment. The main challenges to improving the current situation are improving workers’ employability and achieving a better match between labour supply and demand. Supply side challenges could be tackled by devoting resources to more efficient active labour market policies (ALMPs), focused on vocational and education trainings, orientation, intermediation and career guidance. The supply side would require a more complex policy mix of actions, including generating jobs by improving competition as a result of deregulation and “by investing in infrastructure and adopting smart-specialization strategies that would bring more benefits from further regional integration”. Deeper integration between the region’s countries could boost employment, especially by providing better access to markets through the elimination of trade barriers. Ending import tariffs could make domestic prices fall to the lowest regional levels, but also create trade in the liberalised region. Reflecting on the “status quo” of regional integration, whilst political and, most particularly, security concerns have been the main trigger of regional integration efforts, economic and most particularly trade liberalisation had been a key driver of Euro-Mediterranean integration. But although the European Union had helped lay the groundwork for trade and economic integration in the Euro-Mediterranean region through its commitment to long lasting European integration, Southern and Eastern Mediterranean countries were lagging behind. This was because they hadn’t achieved sufficient levels of integration to ensure a more balanced and coherent integration of markets. For there to be more satisfactory outcomes for employment in the future, then greater South-South integration was considered a pre-condition, as part of wider regional integration. Potential actions that countries could take to deliver sustainable GDP growth and stimulate permanent jobs for the youth sector were linked to “process harmonisation and on de-risking of their economies”. In particular, this would be achieved by reducing technical barriers to trade that were incompatible with WTO rules, making it easier to do business, improving regulatory quality and increasing political stability. Analysing the period between 2015 and 2040, a scenario of regional integration, characterized by “the status quo’s shallow economic integration conditions”, youth unemployment rates were predicted to fall from 25.7% in 2015 to 17.6% in 2040 – as long as countries took action to reduce public budget deficits, improve trade balances and upgrade their infrastructure. Encouragingly, regional Euro-Mediterranean integration would have a net positive impact on youth employment. Depending on its degree and type, net additional youth jobs in non-Euro Mediterranean countries would range from 221,000 with the removal of trade barriers, to 423,000 as a result of institutional and process harmonisation. Over the same period, net additional jobs for total employment in the non-Euro countries would range from 1,520,000 by removing trade barriers, to 2,864,000 with institutional and process harmonisation. Meanwhile, full integration involving both the removal of trade barriers and improved institutional and process harmonisation would account for 570,000 additional youth jobs as part of a total of 3,835,000 extra jobs. The impact from process harmonisation, institutional improvement and investment de-risking would provide the best prospects in terms of youth employment job creation. This would be mainly due to the positive impact this would have on overall economic activity and the alignment of skilled labour with capital. For an integrated economy, a timely upgrade of human capital was necessary to prepare the skills required to match the requirements of the key sectors expected to contribute to youth employment – primarily business and financial services, construction and energy intensive industries. Beyond conventional model-based economic analysis, devising a future job–friendly scenario is essential to respond to technological progress and long-term challenges, such as robotisation and digitalization trends. Here, investment and regulation would help facilitate employability, a shift to new jobs and more flexible work organisation. Focusing on regional dynamics in the Euro-Mediterranean area, technological progress and drivers of global competitiveness, resource and innovation mercantilism would play their part in shaping future regional development. In conclusion, strengthening the position of Mediterranean countries would require reinforced regional integration, using a multi-dimensional comprehensive and novel infrastructure, innovation and industrial policy covering multiple sectors, namely: transport, energy and de-carbonization, water, digital economy, blue economy and sustainable urban development. Enhanced cooperation relating to education, employment and young employability programmes, and social agenda issues (e.g. youth and women empowerment and inclusion) would also be required. It could be a long slow road ahead and much work needs to be done. Watch this space….. 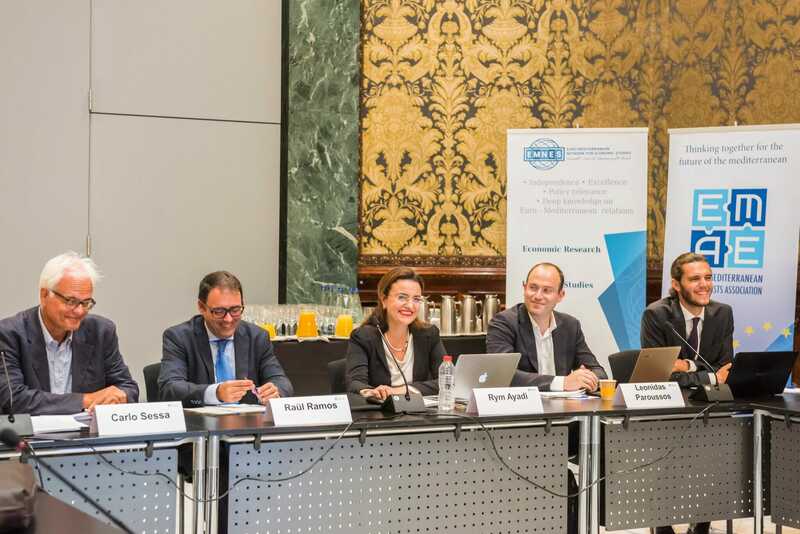 Youth Employment and Regional Integration in the Euro-Mediterranean Region Youth was produced by a team of authors at EMNES, headed by EMNES Project Scientific Leader, Rym Ayadi, who is also President of the Euro-Mediterranean Economists Association (EMEA).